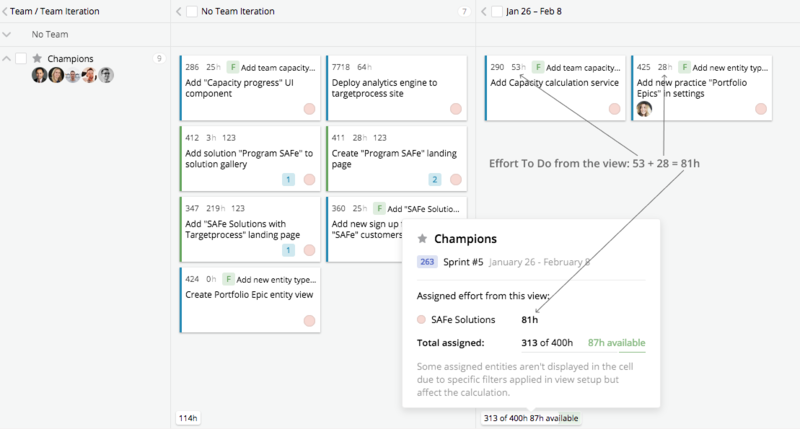 Building high-level plans or roadmaps helps teams to understand how much effort they need to complete the work item and when they can complete it. It also helps to identify earlier that the team is off schedule and probably needs to change their strategy. Let's have a look how high level planning is possible with Targetprocess and look into the Feature effort calculation. 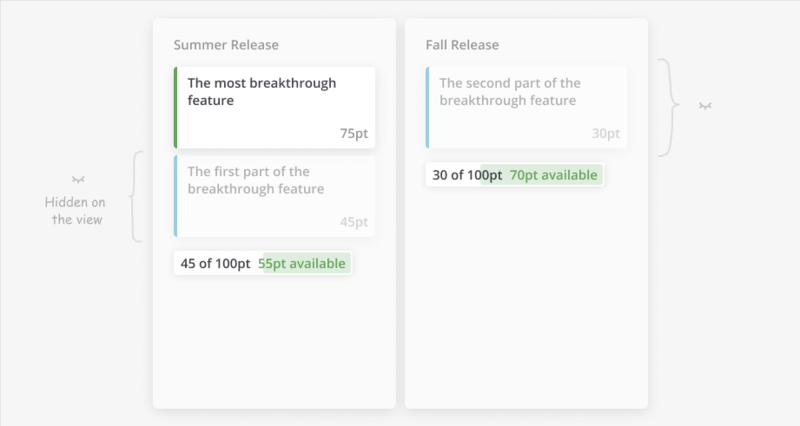 It is now possible to plan Features into Releases by comparing effort needed to complete the Feature and Release Capacity. 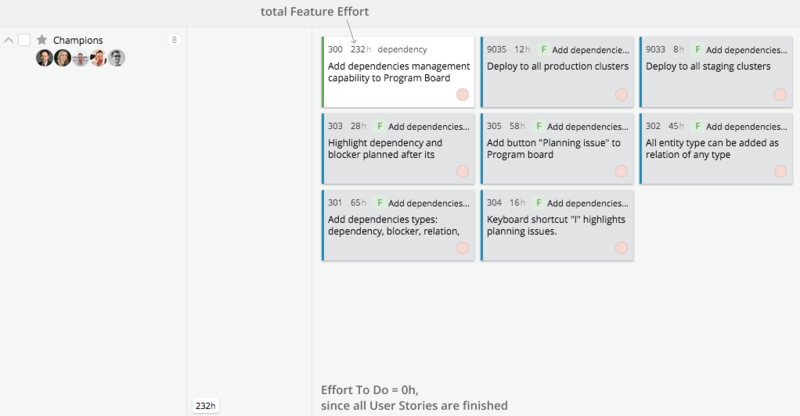 Initial Estimate is effort roughly estimated for the Feature before splitting it into User Stories. This field was introduced to give the ability to estimate work at a high level and create longer-term roadmaps. Effort is the value showing the amount of work which is required to complete the Feature. While planning Features into Releases we calculate the sum of “Effort To Do” field of Features, assigned to a Release. On the picture below all the possible variants of capacity badges are shown. Please, click on any badge to read the explanation. This badge shows the sum of all EffortToDo in a cell. 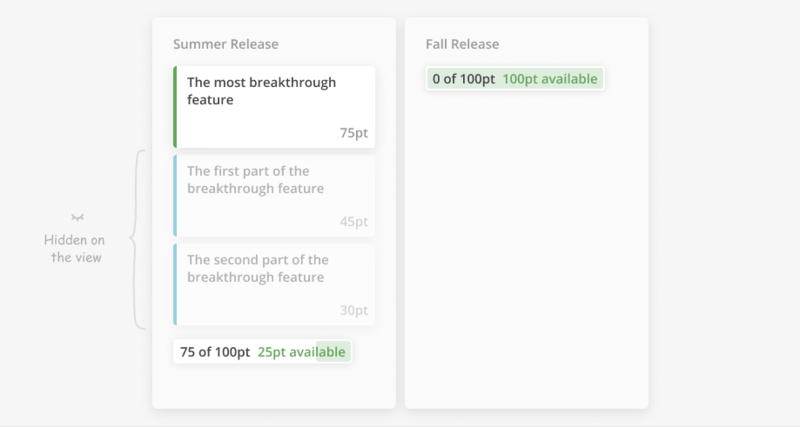 It can be displayed in a Backlog cell or in a Release cell if Capacity is not set for the Release. Note: only Features remaining effort is calculated, not the total effort. This badge shows the sum of all Completed Effort in a Release cell. This historical information can be used for planning future Releases taking the sum of Completed Effort in previous time-boxes as a baseline. It is not calculated for Backlog cells, only for Release cells in the past. This badge illustrates that in current Release all assigned work is completed. It means that all the work items either in final state or their total remaining effort is equal to zero. Where Effort To Do is the sum all Features and User Stories EffortsToDo. And Release Capacity is the value set into the custom field "Capacity" in Release entity. In order to set Release capacity, you need to have "Capacity" custom field for Release. The value can be set either manually or automatically as the sum of Team Iterations capacities assigned to Release. This badge shows that your Release load is calculated roughly, since there are some Features assigned to more than 1 team (collaborative Features) and we do not know, how to allocate the Initial estimate of the Feature until child User Stories are created. Therefore, in order to make the calculation of Release load more accurate it is better to add child User Stories to Feature, assign them to appropriate Teams and give them estimates. You can click on the badge and then "focus on collaborative features" link to leave only features that are assigned to more than 1 team. Let’s go through 2 cases that may occur and look at how we calculate the Release load. A Feature is not decomposed into child User Stories vs a Feature that has been decomposed into User Stories. At the moment when a Feature is not decomposed into User Story its Effort To Do = Initial Estimate. Therefore Initial Estimate influences the Release load. But when the Feature has at least 1 child User Story Initial Estimate no longer influence the load, we use Total Effort instead. Please see the three screenshots below for examples. Note, that User Stories' efforts influence the Releases load. 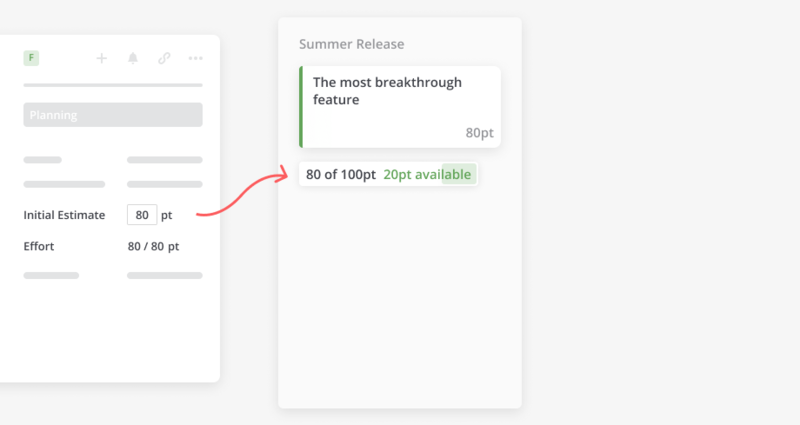 So if the User Stories of the same Feature are assigned to different Releases, their Efforts influence each Release respectively and Feature effort is not taken into account. Please note, that child User Stories need to be assigned together with Feature. Only in this case the work items will influence the Release load. Problem: I assigned a Feature to Release, but its Effort is not reflected in the Release's load bar. Possible reason 1: Please check that all its child User Stories are assigned to the same Release. 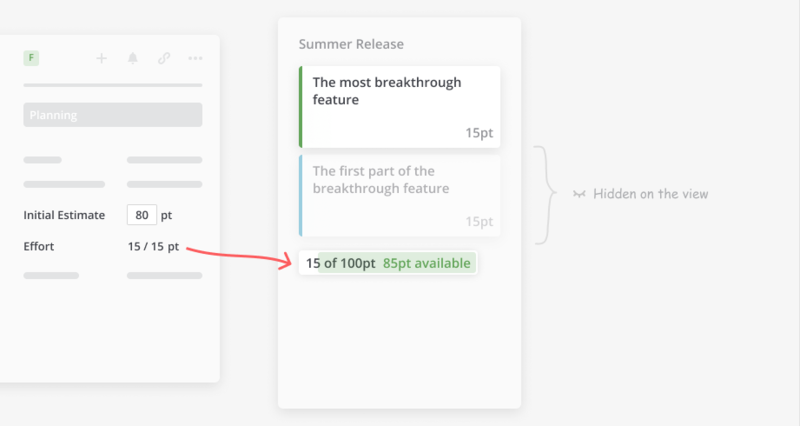 Note that the Feature itself doesn’t influence the Release's load so long as it has child User Stories. 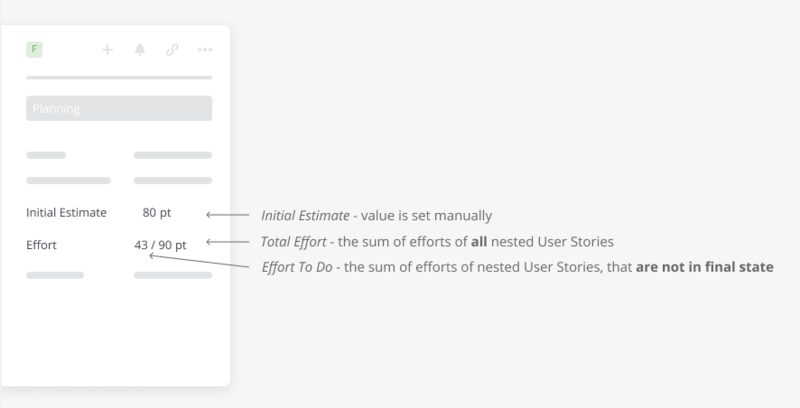 The Effort of a Feature is added to a Release only if there are no nested User Stories and is equal to Feature’s Initial Estimate. Possible reason 2: If all the User Stories are assigned to the same Release, but some of them are in final state. When you look at a Feature card on a board you can see different effort widgets that are set by the board admin. 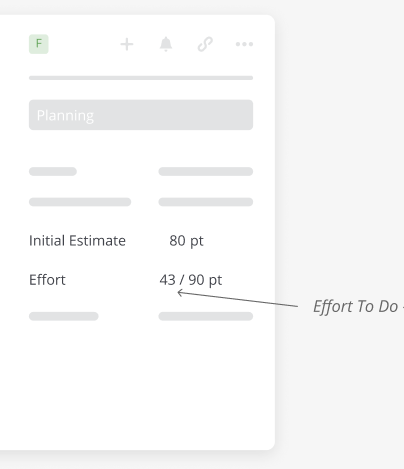 Please, note that you should look at the “Effort To Do” widget, not the “Total Effort”. 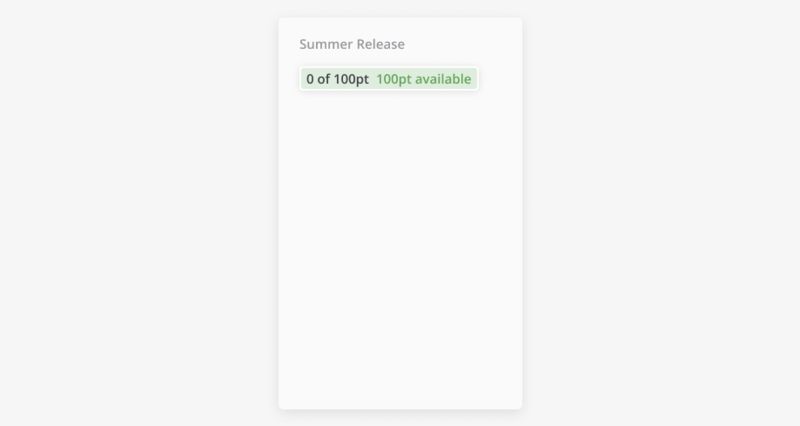 Problem: I see no cards on the board, but my Release load is not 0. Possible reason: the Release load bar always shows the total Effort To Do. 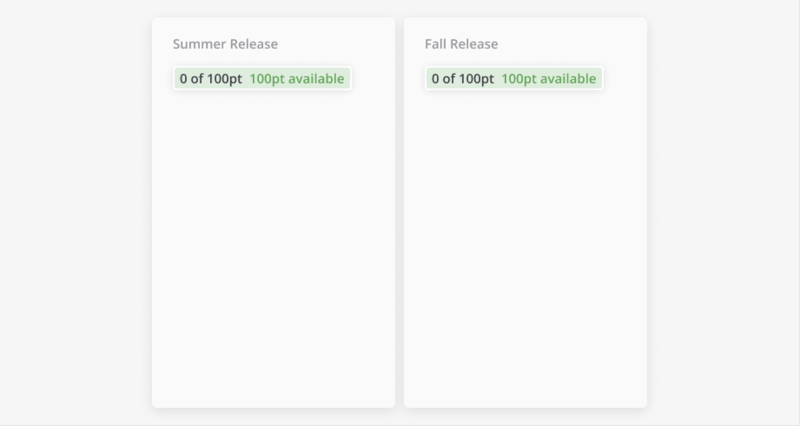 So if the cards that are assigned to a Release are not visible due to board context or filters, you may not see them. To see all work that affects the calculation open the Release's entity details view (click on the column header) and go through tabs “User Stories”, “Bugs”, “Features”. Problem: I set some filters, but the loader shows the load for all the cards outside the filter. Possible reason: This is expected behavior, we always show the total since it is important not to accidentally overload the available capacity. But if you want to see the total of cards that are now visible on board just click on the Release load bar and look at the details.